The World Bank’s latest social safety net report, The State of Social Safety Nets 2018, shows that social safety net coverage is increasing in developing and transition countries worldwide, with nearly 2.5 billion people globally covered by safety net programs in 2018. Government and donor spending on social safety net programs per country is roughly equivalent to 1.5 percent of GDP on average worldwide—with sub-Saharan Africa spending roughly the global average (although spending varies by country and region). The types of social protection programs prioritized by governments and donors also vary at the country and regional levels (see Figure 2.14). 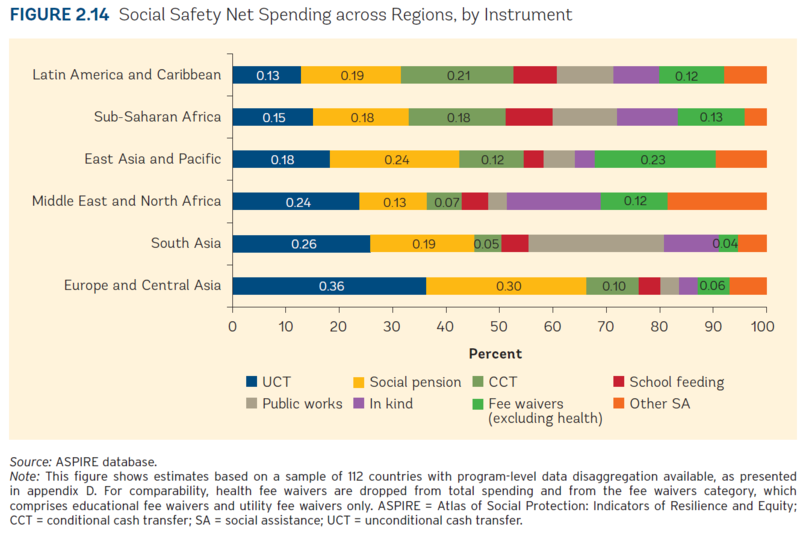 Globally, more than half of social safety net spending is on cash transfers, either unconditional (UCT) or conditional cash transfers (CCT), and social pensions. In sub-Saharan Africa, social pensions and cash transfers are the most widely used instruments, making up just over half of the region’s social safety net spending. Meanwhile, approximately 12 percent of social safety net spending in sub-Saharan Africa is on public works programs, although certain countries—such as Burundi, Central African Republic, Ethiopia, and Liberia—spend significantly more on these programs. South Asia and sub-Saharan Africa—the regions with the largest shares of the world’s poor—have low safety net coverage, not commensurate with their high levels of disaster risk. While the report indicates that social safety nets helped approximately 50 million people globally escape extreme poverty in 2018, still, only one in five of the poorest people in low-income countries is covered by social safety nets. Over time, however, many countries have reinforced their commitments to expanding these programs. For example, in sub-Saharan Africa, both Tanzania and Senegal have dramatically scaled up the coverage of their flagship programs (see Figure 2.13). 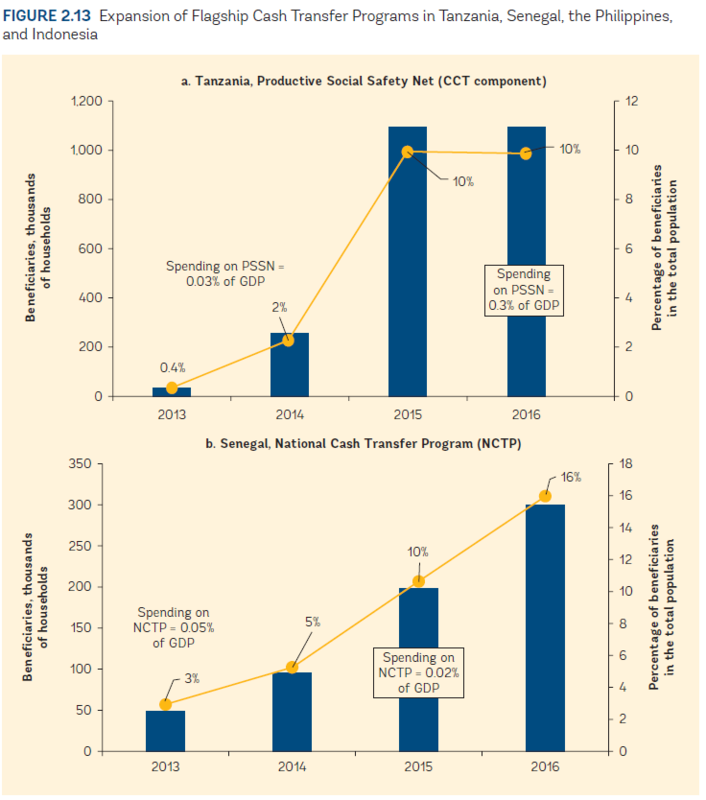 In Tanzania, the government expanded its Productive Safety Net Program from 0.4 to 10 percent of the population between 2013 and 2016, which required a spending increase from 0.03 to 0.3 percent of GDP. Similarly, Senegal broadened its National Cash Transfer Program to cover 16 percent of the population in 2016, up from 3 percent in 2013. It also increased spending from 0.05 to 0.2 percent of GDP. While expanding these programs comes at a fiscal cost, the report argues that the evidence is clear: Investments in social safety nets do make a difference in reducing the poverty gap/headcount and lowering income inequality. Source: ASPIRE database.<br />Note: Data for Tanzania include Zanzibar. 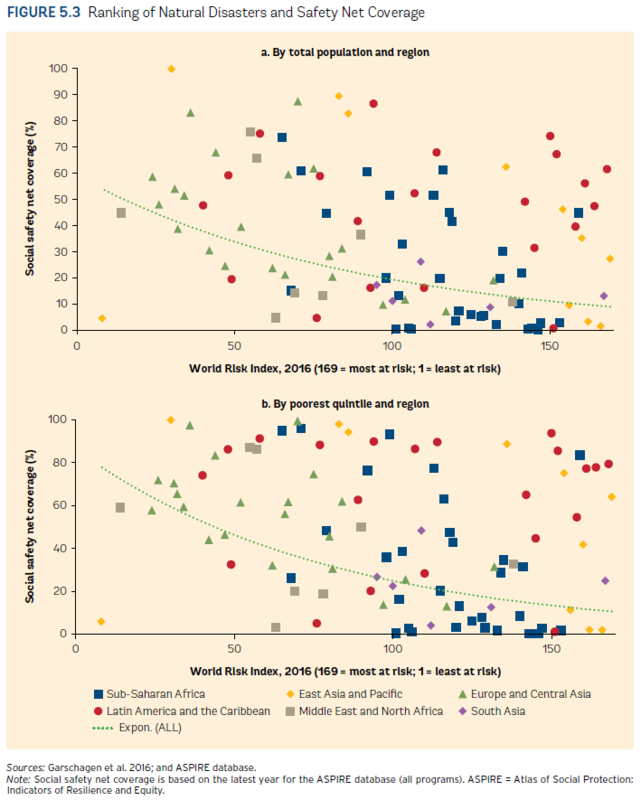 ASPIRE = Atlas of Social Protection: Indicators of Resilience and Equity; CC T = conditional cash transfer. Interestingly, the report notes that countries at high risk of natural disasters often have low safety net coverage, as seen in the figure below. In particular, South Asia and sub-Saharan Africa—the regions with the largest shares of the world’s poor—have low safety net coverage, not commensurate with their high levels of disaster risk. Moving forward, the report suggests that social safety nets will have to become more “adaptive,” in the sense that social protection programs will need to better adapt to all types of shocks, including natural disasters and emerging challenges due to climate change, economic and financial shocks, and conflict and political unrest, among others. While the exact social protection needs will vary by context, the report suggests that building household resilience before crises strike and increasing the responsiveness of programs once crises do occur are two areas that are important to improving social safety nets across countries.